Its devastating effects were felt in more than half of the provinces of Cuba and caused more than 13 billion pesos of damages. Many were affected by sea flooding, strong winds and the chaos that it left in its path. There was extensive material damage and the unfortunate loss of ten lives, even though more than 1.8 million people had been evacuated. The worst affected provinces were Camagüey, Ciego de Ávila, Sancti Spíritus and Villa Clara. Other territories such as Guantánamo, Holguín, Las Tunas, Cienfuegos, Matanzas, Mayabeque and Havana, also suffered extensive damages. Irma came less than a year after Hurricane Matthew, a category 4 storm, devastated Cuba’s eastern provinces in October 2016, and many of these communities were still recovering from this when Irma rolled through. Irma was not Cuba’s first category 5 hurricane. In 1932 a category 5 hurricane killed between 2,000 – 3,000 people. Irma in contrast took only 10 lives – a testament to Cuba’s hurricane preparedness programme. In the United States Huricane Irma left 90 people dead. No country in the world puts so much effort into protecting its people from hurricanes. Cuba’s Institute of Meteorology is one of the world’s best forecasting bodies. Disaster preparedness is taught in schools from year three; so from childhood Cuban’s know how to interpret the information given by forecasters and exactly what to do in an emergency. Schools have regular hurricane exercises on top of two days of nationwide drills that have taken place annually since 1985. Everyone has a role to play; from the Committees for the Defense of the Revolution to the Federations of Cuban Women who help evacuate and look out for vulnerable members of their communities; to school children themselves ensuring they know where shelters are and helping to secure school buildings. At a national level, electricity and gas stations shut off supplies during the storm to prevent loses and damage. Pharmaceutical companies are instructed to redirect resources to produce hydration salts and medicines that may be needed in the aftermath of the hurricane. Special attention is paid to the vulnerable, old and disabled. Family doctors have a register of patients who live alone, those with chronic illnesses, pregnant women or with children under one so that these households can be checked to ensure residents are safe and receive the assistance they need. Television and radio play a vital role in informing the public as the level of alert rises. All institutions are mobilised 48 hours before the hurricane is foreseen to hit the island, to implement the emergency plan, and measures such as massive evacuation are taken. Such preparedness is in stark contrast to the situation in many other countries. The figures speak for themselves: only four people were killed when Hurricane Georges hit Cuba in 1998, by far less than the approximately 600 killed in other countries in the region, with similar or better economic conditions. More recently, hurricane Charley killed four people in Cuba and 30 people in Florida. But as the climate crisis accelerates, many believe that the annual storms to hit the Caribbean are increasing in intensity too. 2017 was the fifth most active year since records began. Cuba is already looking at ways to further protect its environment and people from future storms (see page 10). The country had been in the middle of its worst drought for 100 years, suddenly found reservoirs that had been on the verge of completely drying up months before, began to be overwhelmed by the flooding. In the wake of the hurricane, 158,554 affected homes were reported (14,657 total collapse and 16,646 partial collapse; in addition, 23,560 suffered total roof losses and 103,691 had partial damage to the roof); 980 health institutions and 2,264 schools were affected; 466 poultry farms and 95,000 hectares of various crops were hit by Hurricane Irma; 246,707 telephone services and 1,471 data services and 537 kilometers of roads were damaged. With the total collapse of the National Electric Generation System, in the initial stage some 3,100,000 people had problems with water supply. Total damages caused by the hurricane reached 13.6 billion pesos. Along with the reestablishment of basic services such as water supply, health, education and sanitation as well as work to promote the recovery of housing and food production, national and local authorities had to address the severe damage in key sectors of the economy, such as tourism, industry, electrical generation and roads. The country has made considerable material and financial resources available for recovery, in addition to the transfer of specialised forces to the areas with the greatest impact. Every hurricane that hits Cuba exacerbates previous hurricane damage and an existing shortage of houses. With a lack of building materials in the country, schools, hospitals and public buildings that serve the community are always prioritised. For example, in Havana, where 40 per cent of schools were damaged, almost all were reopened and functioning within a few days. 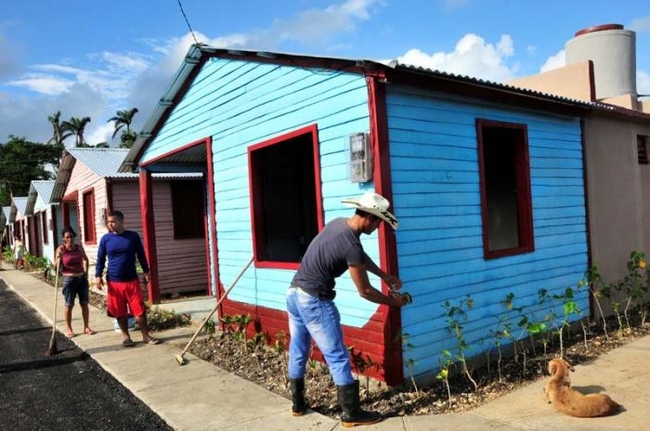 The Cuban government has also made thousands of grants in cash and low-interest long-term loans plus access to subsidised materials to vulnerable residents to help rebuild homes. Just as the population mobilised on an epic scale to minimise loss of life before the hurricane, monumental efforts have continued after the storm to rebuild the country. Rebuilding is the greatest challenge the island faces. Thousands of workers were mobilised across the country and organised into brigades. First priority was to clean up, clear roads, re-establish power, communications and water services to the population. Simultaneously, a giant construction effort was unleashed: reparations to water systems, pipelines, and reservoirs, telephone lines, damaged poles, hospitals, schools and food production centres. More than 130 brigades of linesmen from nine provinces across the country helped return power to 99.6% of a total 315,000 clients just 18 days after the storm, which totally destroyed the province’s electricity grid. Contrast this to Puerto Rico where the population was left without power for weeks. One example of the scale of destruction was the experience at the Antonio Guiteras Thermoelectric Power Plant (CTE). The force of the waves lashing against the nearby breakwaters was such that they swept away the 70 ton concrete structures that formed the supposedly impassable barrier. The sea water circulation station, which protected the plant, collapsed, leaving it inoperable. Work brigades had to move more than 21,000 cubic meters of rubble to get the plant functioning again. The category 5 storm was the worst to hit Cuba in living memory and tore along 800 kilometres of the northern coast, making its impact felt across the entire island. The Cuban people have worked together to rebuild much of the damaged property and restore all the vital utilities to the affected areas. The long term effects on agriculture and some communities will however take years to overcome. CSC’s hurricane relief appeal raised an amazing £87,000. We would like to thank the 727 CSC members, affiliates, friends and supporters who donated to hurricane rebuilding work in Cuba. All of the funds have been transferred to the official hurricane relief account on the island. In response to the appeal, Teresita Vicente, Cuban Ambassador to the UK said: “I would like to express my sincerest appreciation on behalf of the Cuban people, for the wonderful solidarity donation to the relief efforts following the devastating Hurricane Irma, which hit our country in October. This is a wonderful testament to the solidarity of the British people and the friends of Cuba."